Few contemporary artists dare to do something different. 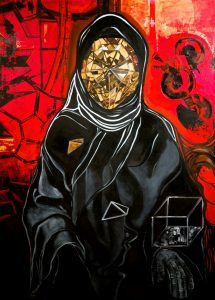 Maria-Veronica Leon provokes minds, re-appropriating a genre of painting that’s fallen into disuse, namely portraiture. Like Ingres, she leaves the psychology of her models untouched. Like him, if we are to believe Baudelaire, she thinks “that nature must be corrected, amended; that cheerful, pleasant trickery, done with the aim of pleasing the eyes, is not only a right, but a duty.” “I want them to see themselves differently, I want to remove them from their everyday life, I give them new life!” she says. So she invents an environment with unexpected dimensions for them, creates a “new life” for them in and for the painting. 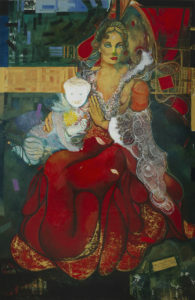 In this more open approach to the concept of the art of portraiture, she transforms her subject into a mythological figure and, leaving its status as a minor genre behind, “the art of portrait making” becomes, with her, painting in the broad sense of the term, painting with multiple stories, a mythology. The cycle of canvases depicting the Duchess of Galliera is exemplary.The famous patron of Genoese arts interpreted by the artist becomes the heroin of a real epic that crosses the ages. 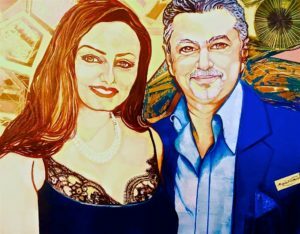 Maria Veronica Leon paints her friends, celebrities, mother and daughter... Flat and face on. Each of her effigies is intimately linked to a pictorial space which is his/her own. Rounded, fertile forms cross the body; Incan, constructivist, rhythmical geometric shapes obtained with bold colours. Symbols like Kabbalistic writings of which only the initiates know the secret meaning can take upthe whole canvas transcending the figure. Oils, collages, acrylics, computer generated images, no matter what the material, it’s the result that counts. Boldly allegorical and cosmic, taking inspiration from the nature she distorts, drawing on her psyche, taking from the cartoon what she needs, her painting is an aesthetically transgressive painting. She loves camouflage effects…Make-up, fabrics, very simple clothes, sometimes skilfully adjusted and frothy lace hide, envelope, metamorphose the model. She sometimes uses CDs as a collage. With their flashing light, like aggravating and provocative contemporary mosaics, these ordinary materials reflect the light, irritating the viewer. The ostentatious demonstration of this mundus muliebris [woman’s world] compares her to Léonore Fini. A dark ecstatic sphinx, Léonore Fini is already part of history while Maria-Veronica Leon invents a post-contemporary world with the pulsating rhythm of techno. 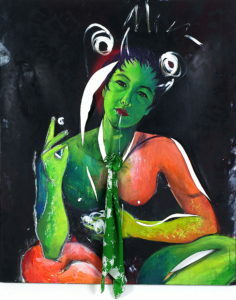 In one of her self-portraits to which she gave the exotic title “La Emperadora de China” she depicts herself with a naked torso, sitting in the lotus position, wild, half green and half red, an extravagant show-off. 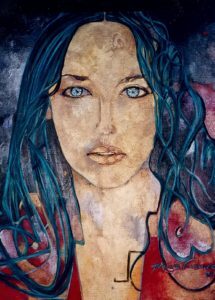 She wears a tie, splits her painting because she is rebelling against the conventional milieu in which she grew up, because she is not what you might think of her, because she is above all a free painter and woman! Like Klimt, she loves gold. For the Austrian painter, the glow and shine of this precious metal is reminiscent of Byzantium. For Maria-Veronica Leon, the Incan spirituality, the light of the Andes, the solar dimension she encircles her figures with. They look us right in the eye, lofty and morganatic or smiling, as if posing always on show, never letting themselves go. Maria Veronica Leon vient et complète la lignée. Elle appartient à la famille des femmes qui apportèrent à l’histoire de l’art la conscience de l’intériorité féminine. Peu d’artistes contemporains osent ce qui ne se fait pas. 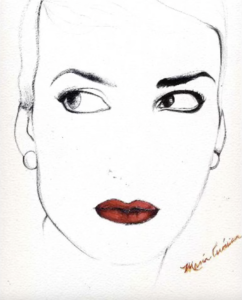 Maria - Veronica Leon provoque les esprits… L’artiste se réapproprie un genre pictural tombé endésuétude, le portrait. Elle aime les caméléonades…Maquillages, étoffes, toilettes très simples, parfois savamment ajustées, dentelles vaporeuses cachent, enveloppent, métamorphosent le modèle. En guise de collages, il lui arrive d’utiliser des C.D. De leur éclat clinquant comme des agaçantes et provocatrices mosaïques contemporaines ces matériaux usuels prennent la lumière irritant le spectateur. La démonstration ostentatoire de ce mundus muliebris la rapproche de Léonore Fini. Sphinge sombre et extatique Léonore Fini appartient déjà à l’histoire tandis que Maria - Veronica Leon invente un monde post contemporain au rythme trépidant de la techno. Dans l’un de ses autoportraits auquel elle lui a donné le titre exotique de «La Emperadora de China » elle se présente torse nue, assise dans la position de lotus, sauvage, moitié verte et moitié rouge, extravagante crâneuse. Elle porte une cravate, fend son tableau parcequ’en révolte contre le milieu conventionnel dans lequel elle a grandi, parce qu’elle est autrement de ce que l’on peut penser d’elle, parce qu’elle est avant tout une peintre et une femme libres ! Comme Klimt elle aime l’or. Pour le peintre Autrichien, l’éclat de ce métal précieux rappelle Byzance. Pour Maria -Veronica Leon la spiritualité Incas, la lumière de la Cordellière des Andes, la dimension solaire dont elle auréole ses personnages. Ils nous regardent droit dans les yeux altiers et morganatiques ou bien souriants, comme pour poser, toujours en représentation jamais à l’abandon. La dimension amoureusement humaine de l’art de Maria - Veronica Leon V on la retrouve dans ses dessins. Elle exécute des masques et des portraits admirables. 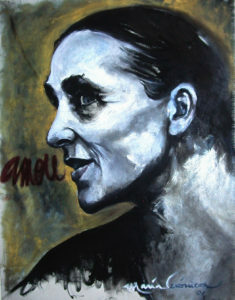 Son dessin semble avoir été prit à la dérobade nonseulement à une autre expression artistique, mais à l’une de plus grandes danseuses contemporaine qu’elle a longtemps accompagné dans ses tournées, Pina Bausch. Sur des petits formats sur papier, le stylo-bille glisse au fil d’un trouble naissant. L’indicible silence du corps s’évapore un peu comme dans le pointillisme de Seurat. Des corps qui s’étirent dans la beauté et le désir puis se replient sur eux-mêmes. Ils souffrent peut-être, d’autre fois expulsent l’énergie de la vie, jouissent se laissent regarder, adorés. La justesse des corps en mouvement rappelle le sublime Degas, proche lui aussi de danseuses de leur jeunes corps malléables. Je n’ai pas parlé des performances, des vidéos du vaste répertoire visuel de cette artiste équatorienne; nide sa vie et de ses voyages et de ses rencontres exceptionnelles. Une prochaine fois, peut-être… Peu d’artistes contemporains sont habités par la conviction d’accomplir à travers leur art une mission destinale, c’est salutaire ! 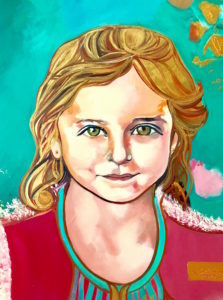 María Verónica is a remarkable painter, an artist that in her early years has already a body of work that is sustained in an important multidisciplinary production. 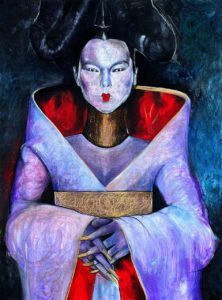 In a globalized world, María Verónica works parallel to fuse two traditions that are divergent in appearance, Modern art, specifically painting, and Contemporary art in the extrapictorical manifestations. 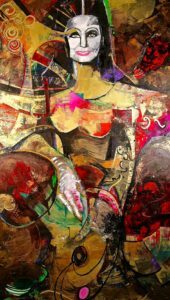 Light and color, as well gold take a dominant place in the chromatic of her paintings, but her leitmotiv is dance and movement, something in harmony with her personality. 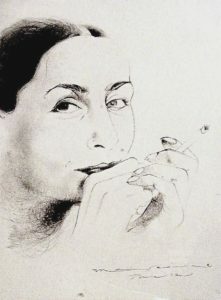 It is for this reason María Verónica has been dedicating part of her creation to Pina Bausch Dance Company and the Wuppertal Tanztheater. Pina Bausch Company fusions dance and theater with a psychological expression and a philosophical dimension that creates an sketch of our existence in contemporary times. María Verónica is fast in taking the instant of the movement, and precise in capturing the nature of the dancers. She uses curved lines that enlace each other, bringing out an spatial volume. When she places the relaxed point in the center of the composition, she works around to achieve the radial movement of the figures. Her drawings are not excessive in their trace and they acquire a solemn character when she uses gold applications and reflections. 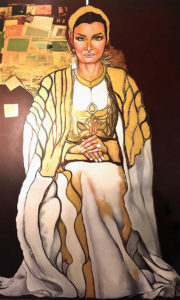 The painting of María Verónica is defined by a neo Baroque environment, which is distinguished even more because of the presence of gold, which remind us of the Venetian school and more particularly of Gustav Klimt. 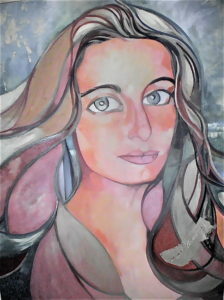 Her favorite subject is the portrait, of which she has had many commissions in Ecuador, as well as in other countries. María Verónica paints herself often. She is the painter and the model, a kind of hedonism which is specially allowed in the art world. Her familiar portraits or double portraits of mother and daughter, talk about a particular subject in our tradition of painting. Her inclination for two of these arts, painting and dance is evident. In this way, María Verónica is inscribed in the renacentist tradition prolonged by Castiglione, who ask to be considered a gentleman (in this case a lady) of culture, the versatility of interests. It is the absolutely truth that we can know the excellence of an artist before by looking at their drawings. It is the first volunteer of geste and the trace. María Verónica shows considerable proof of mastery in her magnificent drawings. They are of high quality, remarkable in their execution and they posed an emotional charge to perceive the generous spirit of her creator. The movement captured in drawing is something very difficult for a visual artist. María Verónica achieves this. Through her condition of contemporary artist and dilettante of dance, this young woman, mundane and voluntary, who works part of her life in the magnificent and luxurious Paris, shows us a multidisciplinary creation without precedents in our art history. Exceptional exhibitions are possible thanks to the courage of this young Ecuadorian lady, daughter of our Costa and pride of our culture. O  R  D  E  R     Y  O  U  R     P  O  R  T  R  A  I  T !